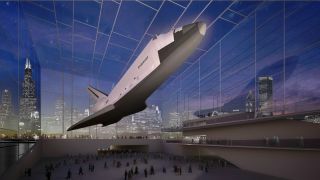 The Adler Planetarium in Chicago, Illinois has proposed a glass pavilion to display a suspended space shuttle orbiter. With only two weeks remaining before NASA announces where its space shuttles will be retired for public display, museums nationwide are putting forth their final pitches as to why they should be bestowed an orbiter. Museums in New York and Chicago recently revealed new concepts for their planned exhibits while in Seattle, officials are raising their profile by literally raising the walls for a space shuttle-sized gallery. Elsewhere, astronauts, elected officials and others with a vested interest in where the shuttles are going are making their voices heard. "I have asked that team to bring that to a head... so that I can announce a decision on the 30th anniversary of the flight of STS-1, Columbia, [on] April 12th," Bolden told the House of Representatives' Committee on Appropriations. NASA Headquarters has confirmed that an event of some type will be held on April 12, but the specific details as to how the announcement will unfold are still being decided. Twenty-nine organizations expressed interest in displaying an orbiter in response to the space agency's first request for proposals in 2008. Since then, eight have dropped out, leaving 21 museums, science centers and visitor centers vying for a retired shuttle. Only the Smithsonian Institution's National Air and Space Museum, which currently houses the prototype Enterprise at its Steven F. Udvar-Hazy Center in Chantilly, Va., has its display ready. Promised Discovery since 2008, the Smithsonian plans to wheel out Enterprise and wheel in its flown-in-space orbiter counterpart. For the others, if they are chosen to receive Atlantis or Endeavour (or the soon-to-be-displaced Enterprise) they'll need to make room, literally. Most have proposed erecting a new building or hangar to fulfill NASA's requirement that the shuttle be displayed indoors. The latest to reveal their idea for how they would house a shuttle has been the Adler Planetarium in Chicago, Ill. Described as an "inspirational rendering" rather than being the final design, the Adler's proposed state-of-the-art glass pavilion is shown in an artist's concept as suspending the shuttle well above visitor's heads. "In one direction, the shuttle would be framed looking out over Lake Michigan, and in the other direction, it would face Chicago's beautiful skyline," Adler president Paul H. Knappenberger Jr. said in a statement. New York City’s Intrepid Sea, Air and Space Museum's revised concept art surrounds the space shuttle with platforms and exhibits. The Adler isn't the only museum that has plans for a glass home for its shuttle. The Intrepid Sea, Air and Space Museum, which itself is a converted aircraft carrier that once recovered Mercury and Gemini capsules post-splashdown, was one of the first to release its designs for how to house an orbiter. Located in New York City, the Intrepid recently revised its conceptual artwork for a glass-walled hangar to be located alongside the pier where it is berthed. The Intrepid's new designs now call for the shuttle's cargo bay doors to be open and for spacesuit-clad astronauts to be working with a satellite held by the orbiter's robotic arm. Like the Adler, the Intrepid stresses that their idea is just a concept for now and is subject to change. But not all the museums competing with them are waiting for a shuttle to arrive to start building. The National Museum of the U.S. Air Force in Dayton, OH has been refining its design for a new hangar since before NASA announced it was seeking proposals. Recently, the Boeing Company announced it was donating $5 million for construction of the facility. And in Seattle, Wash., the first wall of a new Space Shuttle Gallery has already been erected adjacent to the Museum of Flight. The 15,500 square-foot building is scheduled to be completed this fall, well ahead of when the first orbiters are expected to be ready for delivery. While a picture (or space shuttle display concept) may be worth a thousand words, those seeking to back favorite shuttle venues have been espousing that much and more. From New York to Dayton, Chicago to Seattle, newspaper editorial columns have been filled by those explaining why a shuttle should come to their city. In many cases, those making the argument have been the area's elected officials. In Texas, where Space Center Houston is competing for a shuttle to display for Johnson Space Center, a delegation including Rep. Sheila Jackson Lee has been reaching out to President Obama and others to make the case to "bring the shuttle home" to Houston. "Recent reports indicate that the City of Houston is at or near the bottom of a short list... to host a public display of the space shuttle orbiter," reads the delegation's letter to the White House, as it appeared in the Houston Chronicle. "We respectfully submit that denying ... Johnson Space Center and the City of Houston the honor of displaying an orbiter would ... create a blemish on its significance to the legacy of NASA as it closes this chapter in its history." Continue reading at collectSPACE.com to learn where Endeavour’s final pilot, the commander of the final space shuttle mission, and NASA’s Administrator personally feel the space shuttles should be displayed.